New signing Simon Vukcevic scored his first Blackburn goal as they edged past League One side Leyton Orient in the Carling Cup third round at Ewood Park. Jason Roberts put the hosts ahead with a penalty just before half-time after Martin Olsson had been brought down. David Mooney equalised after the break but Ruben Rochina made it 2-1 with a simple tap-in and Vukcevic drilled in to extend the lead. Dean Cox added a late goal but it was too late for Leyton Orient. Blackburn manager Steve Kean was confident enough to make eight changes to the side that beat Arsenal on Saturday, and it paid off with back-to-back wins for the first time since 8 January. The weekend protests must seem a long time ago. Rovers were always the better side in the first half and deserved their interval lead through Roberts from the penalty spot. Orient were made to wait for their hosts to reappear for the second half but whether it was that which spurred them into life or manager Russell Slade's words at the interval, they came out more positively. And Mooney levelled in the 64th minute with a smart finish from George Porter's cross. But January signing Rochina and Vukcevic, who joined last month, put the game beyond the visitors' reach. Roberts' shot was half-saved by keeper Lee Butcher, leaving Rochina to roll the ball into an empty net for his fourth strike in as many matches. Then Vukcevic scored a wonderful goal after Ryan Lowe's cross was only half-cleared. Cox found the net late on to leave the Blackburn fans sweating, his shot going in off the post with three minutes remaining, although it came too late to force extra time. 90:00+4:07 The referee signals the end of the game. 90:00+0:40 Vincenzo Grella challenges Dean Cox unfairly and gives away a free kick. Matthew Spring restarts play with the free kick. 90:00+0:07 Outswinging corner taken from the right by-line by Mauro Formica. 89:16 Corner taken right-footed by Mauro Formica, Grant Hanley takes a shot. Lee Butcher makes a save. 89:05 Shot by Jason Roberts. Save by Lee Butcher. 88:29 Matthew Spring challenges Gael Givet unfairly and gives away a free kick. Free kick taken by Radosav Petrovic. 87:52 Substitution Ayegbeni Yakubu is brought on as a substitute for Ruben Rochina. 87:24 Outswinging corner taken by Ruben Rochina from the left by-line, Grant Hanley produces a header from deep inside the six-yard box that clears the crossbar. 87:08 Corner taken by Ruben Rochina from the left by-line, Terrell Forbes manages to make a clearance. 86:30 Corner from the right by-line taken by Ruben Rochina, Vincenzo Grella takes a shot. Terrell Forbes gets a block in. 85:34 Assist on the goal came from Elliot Omozusi. 85:34 GOAL - Dean Cox:Blackburn 3 - 2 Leyton Orient Dean Cox grabs a goal from the edge of the penalty box to the bottom right corner of the goal. Blackburn 3-2 Leyton Orient. 84:11 Substitution (Blackburn) makes a substitution, with Mauro Formica coming on for Simon Vukcevic. 83:55 Marc Laird takes a shot. Blocked by Gael Givet. 81:59 Substitution Mike Cestor comes on in place of Charlie Daniels. 78:34 Free kick awarded for a foul by Ben Chorley on Jason Roberts. Direct strike on goal from the free kick comes in from Radosav Petrovic, comfortable save by Lee Butcher. 77:51 Substitution Marc Laird replaces Jimmy Smith. 77:21 Corner taken left-footed by Ruben Rochina from the right by-line, Header from deep inside the area by Grant Hanley goes harmlessly over the crossbar. 77:07 Shot from 6 yards by Ruben Rochina. Save by Lee Butcher. 74:56 David Hoilett provided the assist for the goal. 74:56 GOAL - Simon Vukcevic:Blackburn 3 - 1 Leyton Orient Simon Vukcevic finds the back of the net with a goal from the edge of the penalty box to the bottom left corner of the goal. Blackburn 3-1 Leyton Orient. 74:18 Outswinging corner taken by Simon Vukcevic from the left by-line played to the near post, clearance made by Ben Chorley. 74:04 David Hoilett has an effort at goal from 12 yards. Save made by Lee Butcher. 72:18 Corner taken by Ruben Rochina, Headed effort from deep inside the penalty area by Simon Vukcevic misses to the left of the goal. 72:13 The ball is delivered by Ruben Rochina, blocked by Matthew Spring. 71:05 Substitution Leon McSweeney comes on in place of David Mooney. 70:17 GOAL - Ruben Rochina:Blackburn 2 - 1 Leyton Orient Ruben Rochina finds the net with a goal from inside the penalty area to the bottom left corner of the goal. Blackburn 2-1 Leyton Orient. 69:38 Shot from 12 yards by Jason Roberts. Save by Lee Butcher. 68:18 Radosav Petrovic produces a drilled right-footed shot from 30 yards. Blocked by George Porter. 66:33 Floated corner taken right-footed by Ruben Rochina. 66:12 Simon Vukcevic takes a shot. Terrell Forbes gets a block in. 63:31 Assist on the goal came from George Porter. 63:31 GOAL - David Mooney:Blackburn 1 - 1 Leyton Orient David Mooney fires in a goal from deep inside the penalty box to the bottom left corner of the goal. Blackburn 1-1 Leyton Orient. 62:38 Gael Givet has a headed effort from close range and clears the bar. 62:19 Corner taken left-footed by Ruben Rochina, Lee Butcher makes a save. 62:01 David Hoilett has a drilled shot. Save made by Lee Butcher. 60:43 George Porter gives away a free kick for an unfair challenge on Martin Olsson. Mark Bunn takes the free kick. 60:21 David Mooney produces a drilled left-footed shot from 18 yards. Save by Mark Bunn. 59:43 Corner from the left by-line taken by Ruben Rochina, save by Lee Butcher. 59:29 Simon Vukcevic takes a shot. Save by Lee Butcher. 58:42 David Hoilett produces a drilled left-footed shot from 20 yards. Ben Chorley gets a block in. 55:01 David Mooney takes a shot. Save by Mark Bunn. 54:22 Free kick awarded for an unfair challenge on Ben Chorley by Jason Roberts. Lee Butcher takes the direct free kick. 51:51 Tom Clarke challenges Vincenzo Grella unfairly and gives away a free kick. Ruben Rochina restarts play with the free kick. 49:52 Dean Cox takes the inswinging corner, Header from close in by Jimmy Smith misses to the right of the target. 49:07 Ruben Rochina concedes a free kick for a foul on George Porter. The free kick is swung in left-footed by Charlie Daniels, save made by Mark Bunn. 48:14 Free kick awarded for an unfair challenge on Simon Vukcevic by George Porter. The free kick is delivered left-footed by Ruben Rochina from left wing, Ben Chorley makes a clearance. 47:55 The assistant referee flags for offside against David Mooney. Martin Olsson takes the indirect free kick. 45:18 Drilled right-footed shot by Jason Roberts. Lee Butcher makes a save. 45:01 Substitution Nick Blackman goes off and David Hoilett comes on. 45:00+1:14 The half-time whistle blows. 43:35 Assist by Martin Olsson. 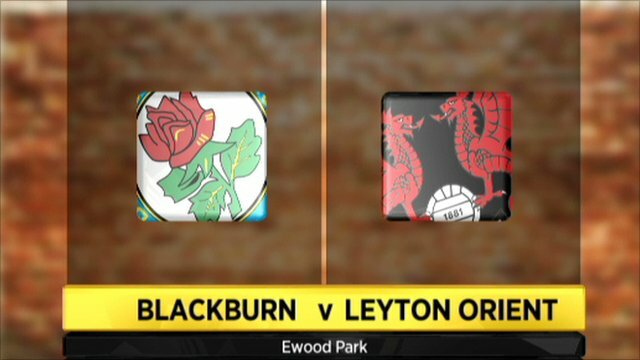 43:35 GOAL - Jason Roberts:Blackburn 1 - 0 Leyton Orient Jason Roberts scores a placed penalty. Blackburn 1-0 Leyton Orient. Correction - 42:37 Terrell Forbes challenges Martin Olsson unfairly and gives away a Penalty. 42:37 Unfair challenge on Martin Olsson by Ben Chorley results in a Penalty. 41:05 Unfair challenge on George Porter by Martin Olsson results in a free kick. Ben Chorley restarts play with the free kick. 38:30 The official flags David Mooney offside. Mark Bunn takes the free kick. 36:46 Unfair challenge on Jimmy Smith by Vincenzo Grella results in a free kick. Direct free kick taken by Elliot Omozusi. Correction - 35:58 Effort from the edge of the penalty area by Vincenzo Grella goes wide of the left-hand post. 35:58 Martin Olsson produces a left-footed shot from the edge of the area and misses to the left of the goal. 34:30 Corner taken by Ruben Rochina from the left by-line. 32:30 Free kick awarded for a foul by Ben Chorley on Jason Roberts. Vincenzo Grella restarts play with the free kick. 30:36 Dean Cox concedes a free kick for a foul on Ruben Rochina. Grant Hanley restarts play with the free kick. 27:10 Effort from long range by Simon Vukcevic goes wide left of the goal. 20:55 Gael Givet takes a shot. Save by Lee Butcher. 20:38 Inswinging corner taken from the right by-line by Ruben Rochina. 20:09 Jason Roberts produces a drilled right-footed shot from 6 yards. Blocked by Terrell Forbes. 18:33 Matthew Spring challenges Ruben Rochina unfairly and gives away a free kick. Vincenzo Grella takes the direct free kick. 17:03 Inswinging corner taken left-footed by Ruben Rochina. 16:50 Shot by Ruben Rochina. Blocked by Matthew Spring. Correction - 13:54 Headed effort from inside the area by Simon Vukcevic misses to the left of the target. 13:54 Header by Simon Vukcevic from deep inside the penalty area misses to the left of the target. 11:15 Shot by Ruben Rochina from 30 yards. Blocked by Terrell Forbes. 9:37 Unfair challenge on Jason Roberts by Elliot Omozusi results in a free kick. Radosav Petrovic takes the free kick. 5:54 Drilled right-footed shot by Simon Vukcevic. Blocked by Tom Clarke. 5:09 Free kick awarded for a foul by Simon Vukcevic on Dean Cox. Charlie Daniels takes the direct free kick. 3:45 Nick Blackman produces a left-footed shot from just outside the box that misses to the right of the net. 2:51 Free kick awarded for a foul by Vincenzo Grella on Dean Cox. Direct free kick taken by Dean Cox. 2:15 The ball is crossed by Ruben Rochina, Lee Butcher makes a save. 1:36 Corner taken left-footed by Ruben Rochina, Terrell Forbes makes a clearance. 1:07 George Porter challenges Martin Olsson unfairly and gives away a free kick. Grant Hanley takes the free kick.